The winter can bring unpredictable weather and with that hazardous driving conditions. From rain to the snow and ice here’s some tips to keep you safe. Avoid sitting in a cold car waiting for the tow truck to take you home by having a bottle of Antifreeze in the boot. This will not only keep your engine at the right temperature (and avoid it freezing up) it will prevent damage to other components of your cooling system. Trying to attach jump leads in the cold weather is no-ones idea of fun. During the winter your battery takes a lot of use through the lights, heating and wipers. 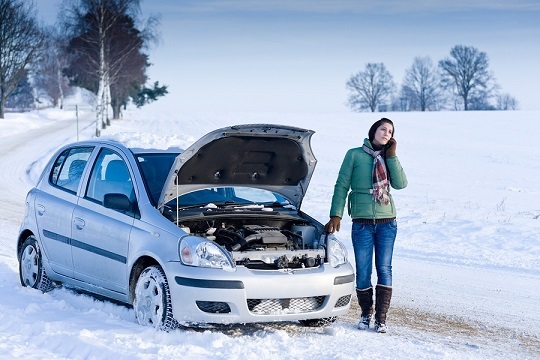 Additionally low winter temperatures have an adverse affect on your car battery too. Prepare early by having your battery and electrical system thoroughly checked. At Auto Pro-Fit we can identify any signs of a dying battery and advise on replacements. It tends to rain frequently in winter and with this comes Aquaplaning. Aquaplaning happens in high speeds so reducing your speed in wet conditions is important. Also check your tyres not only have the correct pressure but also the tread depth of your tyres is 1.6mm. Poor or worn out tyres can cause aquaplaning as the tyres will be unable to grip under the water and road. Our trained technicians (enter tyres link) can check your tyres keeping you well prepared for the weather. Visit Auto Pro-Fit today to get your FREE winter check.